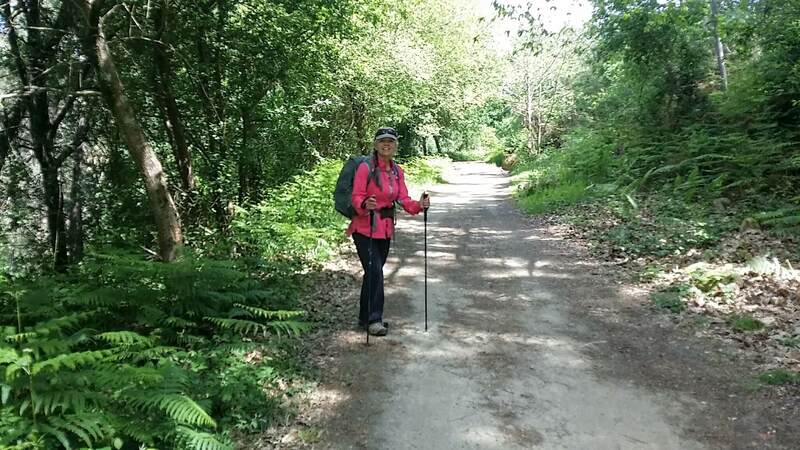 On our day twenty-one on the Camino Portugués, we walked four kilometers on the Sendal Litoral, then went farther inland to complete the day on the Coastal Route, walking through Vigo and later via the high, flat and easy plateau trail system, called the Camiño da Traída das Augas. While the walk was beautiful, and much better than we anticipated, it was a solitary walk. We saw almost no pilgrims on this day. Amazing! I had learned to lean into the silence, the solitude and the contemplative experience, at times chatting and processing with Rich, my husband. I had accepted that this was the purpose of my Camino. Here is my Google map, created from my GPS tracks. I placed the albergues/hotels/cafés on the maps that we visited, plus other albergues of interest. It is not a comprehensive list, by any means! For a complete list of accommodations, click here. 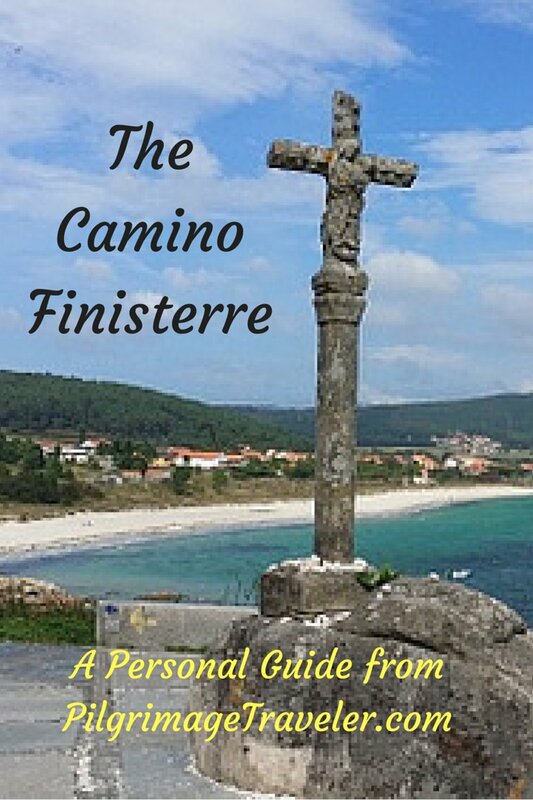 There are lots of services that you will encounter on this day twenty-one on the Portuguese Camino. 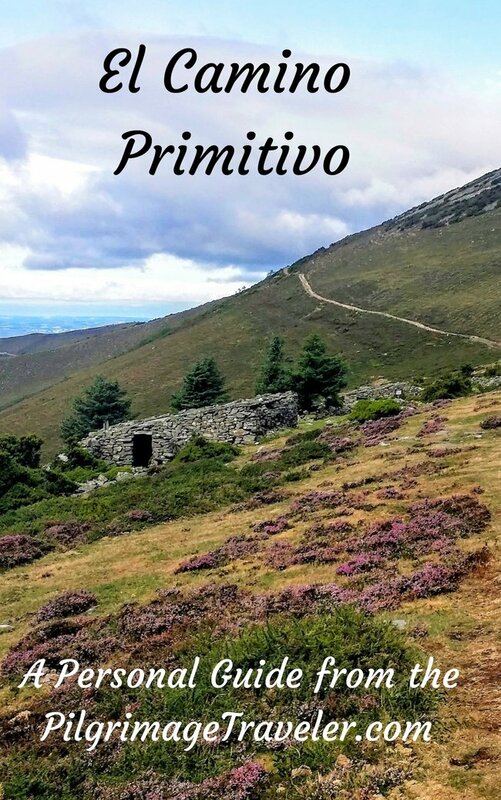 The elevation change was relatively easy for us, but with a significant climb of 150 meters (550 feet) out of Vigo and onto the plateau trail system, referred to above. We awoke in our friends house, to a cool, clear morning. 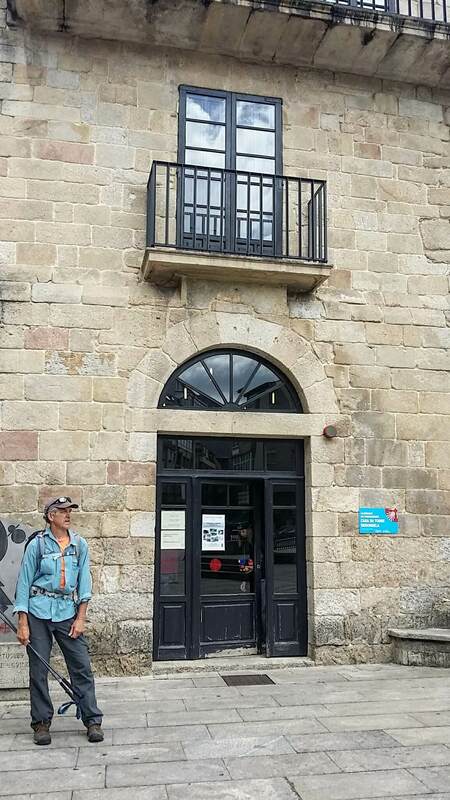 Once again, at the "Albergue de Glyvia" we had a lovely breakfast from our "Camino Mother." She was so gracious a hostess! There are options, to walk closer to the sea, than on the PO-325, especially after the Soccer Complex in San Miguel de Oia. There are no yellow arrows here, so you need a map, or a very detailed guide (of which I am unaware). There were no yellow arrows on the Senda Litoral on our day twenty, and there were none here on day twenty-one either on the Portuguese Way. 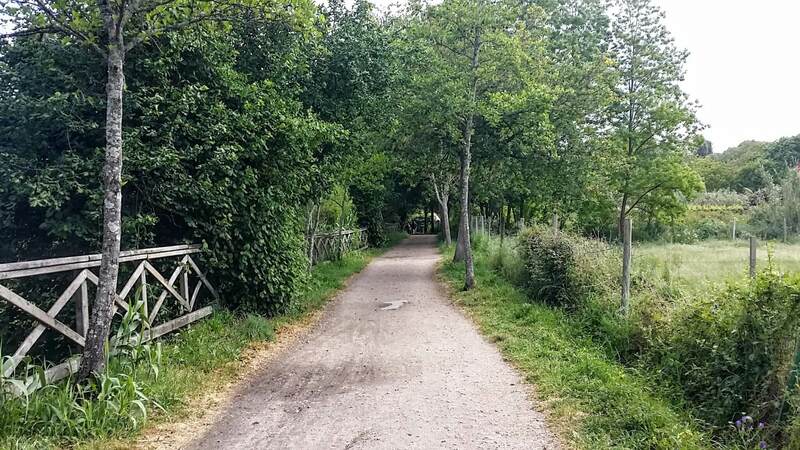 We chose to stay on the PO-325 as there is a nice bike path which continues all along this long stretch, for easy and direct walking of the 3.72 kilometers we needed to cover. As you can see in the photo, it rained here the night before, and perhaps hailed. Note the shredded leaves on the street. Rounding the northern coastline, the Isla de Toralla comes into view from PO-325. Shortly you come to an intersection with the PO-325 and a road which runs closer to the sea. The sign, below showed the way to Canido. We missed this turn, but kept on the PO-325. This turned out to be a good decision for us, as we had chosen a long day and this route that we created was the most direct route. Along the highway we passed this nice little chapel, the Capilla Nuestra Señora De Los Liñares. 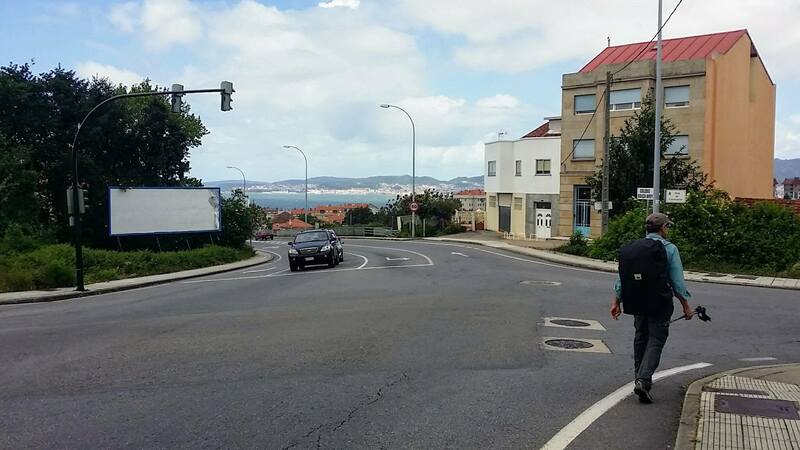 After 3.72 kilometers, for us, at a major roundabout, in photo below, showing the direction toward the PO-552, our old coastal highway friend, we took a right turn onto the Estrada do Vao. We walked on this street for 0.57 km until meeting up with the PO-552. A left turn here onto the PO-552, called the Estrada Camposancos and lo and behold the yellow arrows of the Coastal Route appeared!. I was quite happy about this, as any route trying to hug the coastline from here looked difficult, longer and through the industrial shipyards of Vigo. This section, below, was industrial enough. 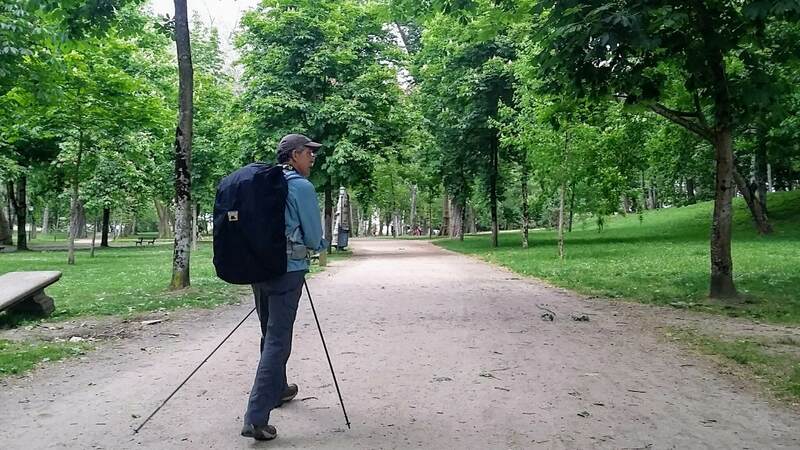 After another 0.5 kilometers on the Estrada Camposancos, the pilgrimage traveler has another decision to make. 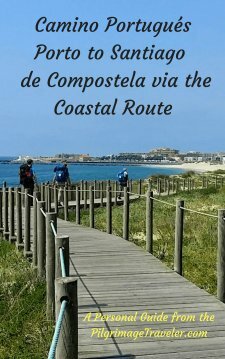 The traditional Coastal route turns right on a small side road, the Camino Pitasia, shown below. The other choice is to continue on into the center of town via the PO-552. This is the more direct and shorter route, via the Avenida Citroën. If I had know exactly where we were at this juncture, most likely we would have taken the more direct route. However, we chose to just follow the yellow arrows and onto the Camino Pitasia. 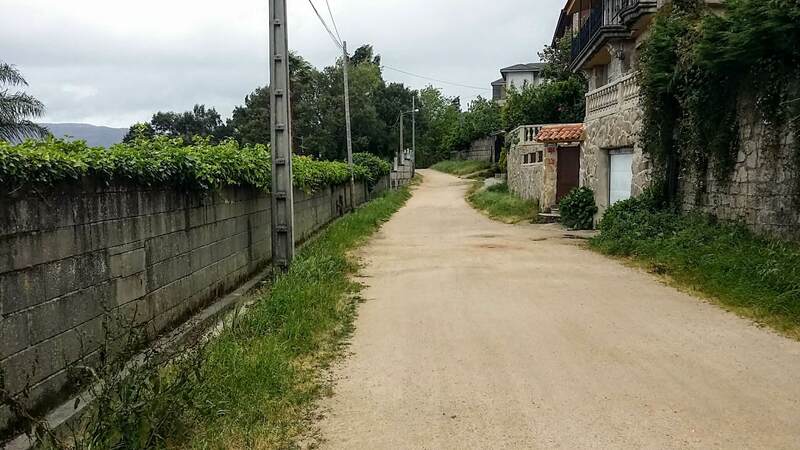 I have no regrets as the Camino planners did well to walk us through quaint, quiet roads in the middle of the suburbs of Vigo. Plus we saw some amazing things we would have otherwise missed, as you shall see further below! 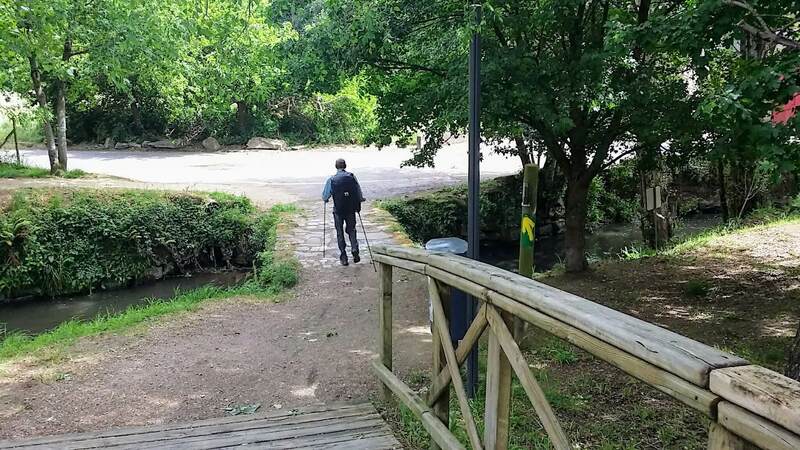 Just 400 meters on the Camino Pitasia, and then it ends, where you turn left, then an immediate right to walk under the overpass of the highway, the VG-20..
At the next intersection, in 300 meters, turn left then an immediate right onto a dirt road, the Camiño do Río de Gonzas to walk along a creek. 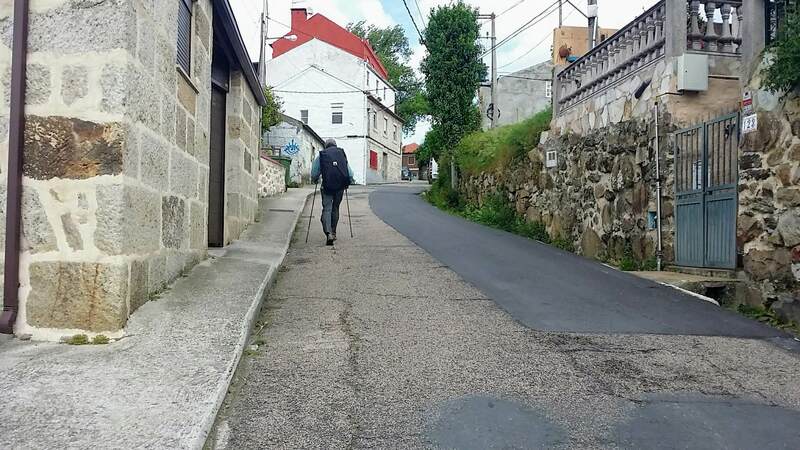 We walked along the creek for about 100 meters, then left on another dirt road, the Camiño Rodeira, which turns into a paved road, to walk up a long hill and back into town. 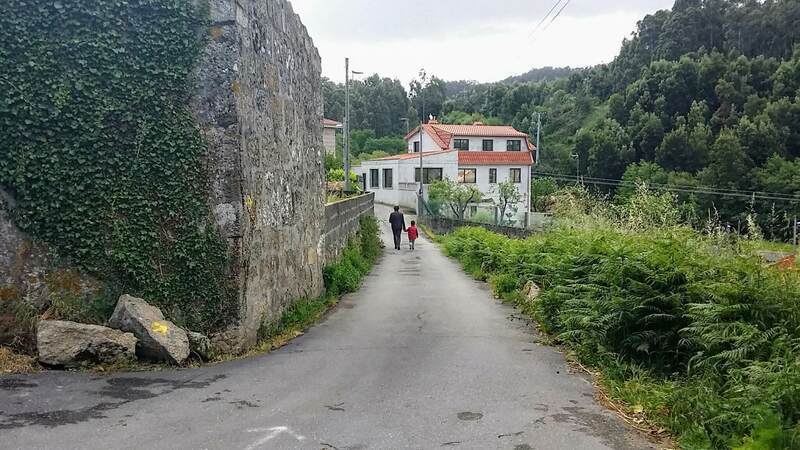 Here is a photo of a woman and child, walking along the incredibly rural-looking Camiño Rodeira. As it turned out, they were walking to the church shown farther below. It is always fascinating to me, how this road was chosen for the Camino, because the features were superb. 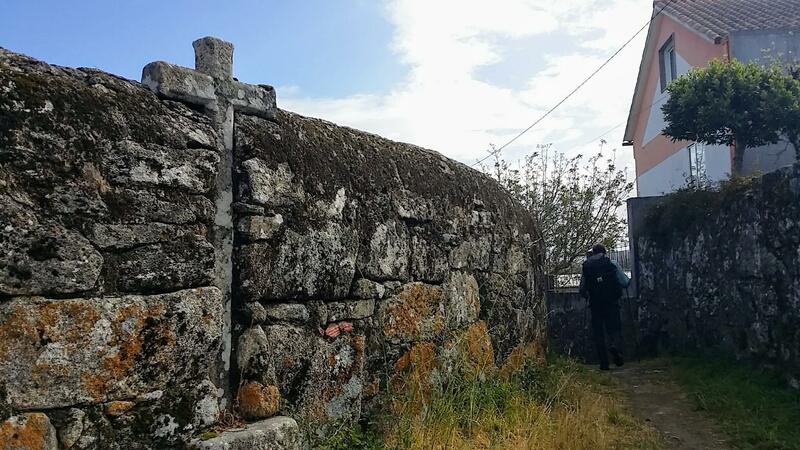 Farther along the Camiño Rodeira, the street is lined with high walls, and in this place, crosses were embedded into the wall every so often! Fantastic! 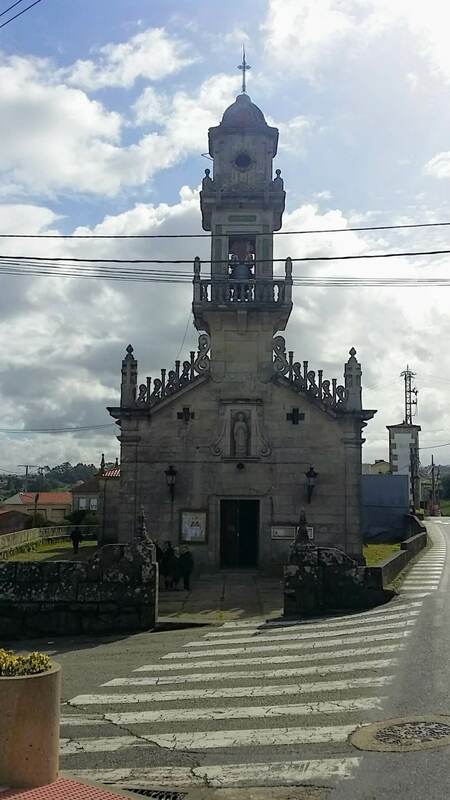 About 1/2 kilometer on the Camiño Rodeira, we turned onto the Estrada Matamá Pazo-Comesaña, and walked by the church mentioned above, the Parroquia de San Andrés de Comesaña. It was the morning of Sunday, April 30th, 2017 and the church bells were ringing! It was so lovely a sound. 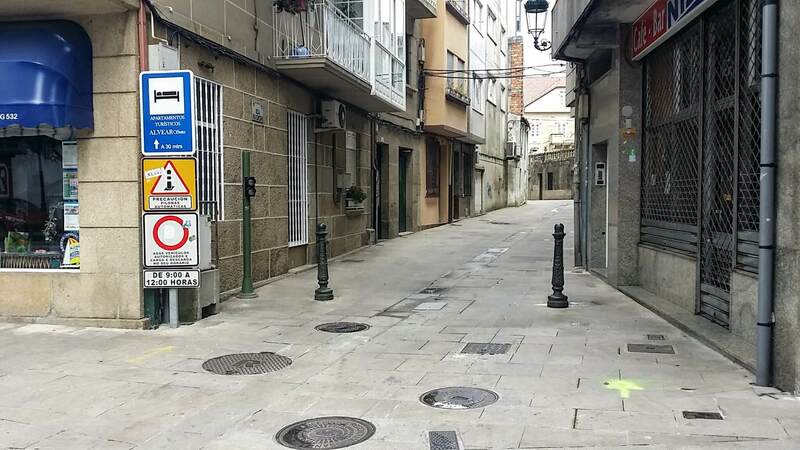 After about another 1/3 kilometer, the Camino turns right onto the Camiño Sanín. 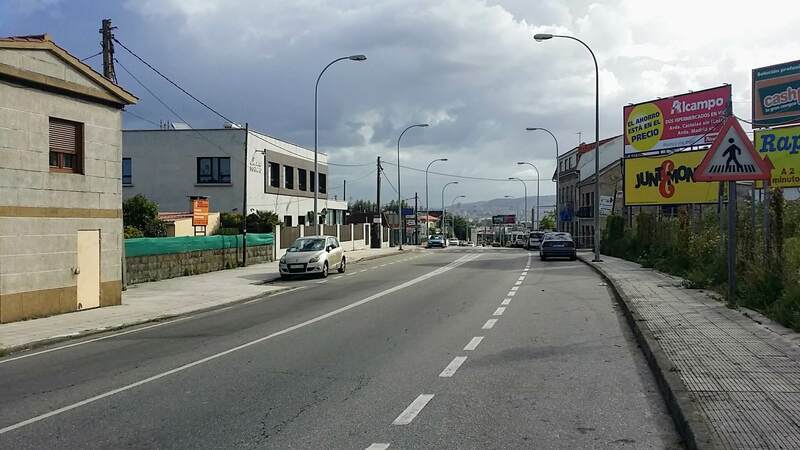 It is a full 2 km along this street, until turning right onto the Rúa de Leonardo Alonso. If you were to zoom onto this section, on my Google map, you would notice that we did a lot of round about walking through here! We had trouble finding any yellow arrows, so be careful and follow my advice! 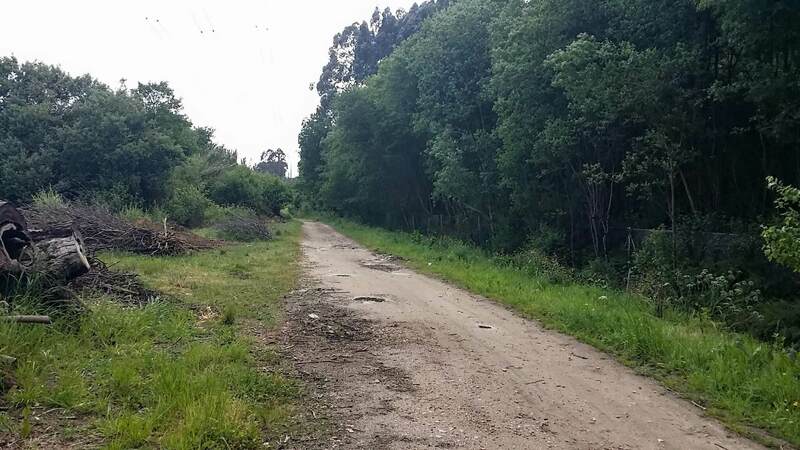 The most direct route I can now see is for the pilgrimage traveler to stay on the Camiño Sanín for the full 2 km as directed above. We even asked the locals for directions in this section, and got two different answers! Ha! Turns out they both were right. 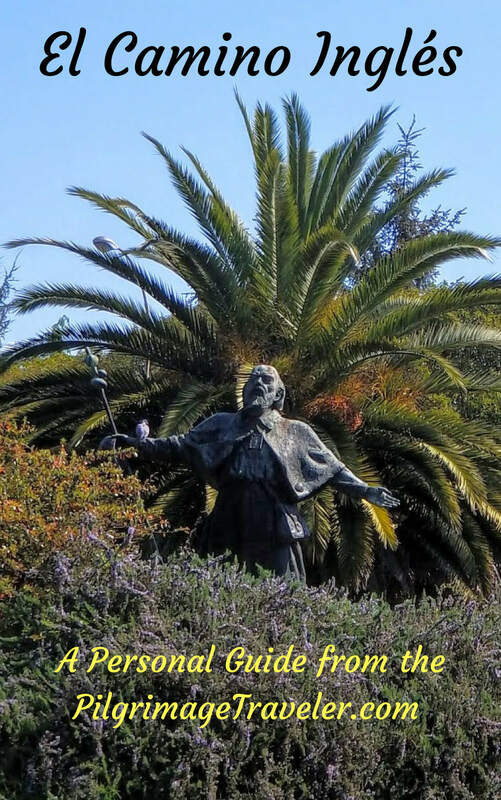 You must get across the highway, the PO-010, one way or another, either under it by staying on the Camiño Sanín, or over it on the Rúa de Leonardo Alonso! We continued on the Rúa de Leonardo Alonso for only about 1/4 kilometer, but what an experience this small stretch was! 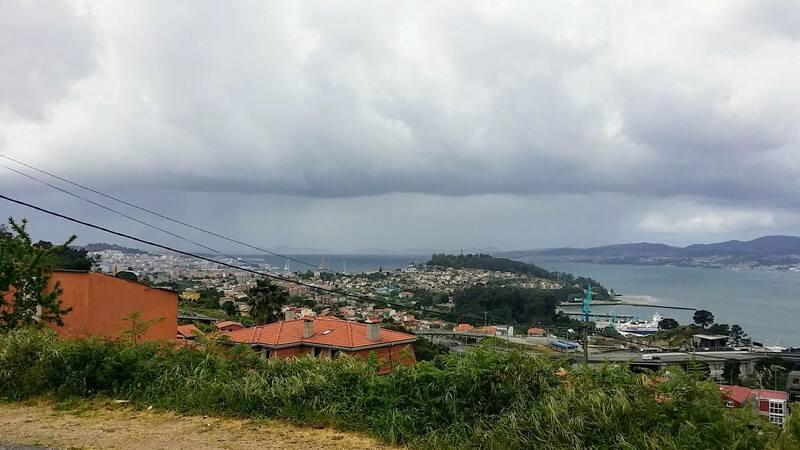 As far as I can tell, this suburb of Vigo is called Matamá. 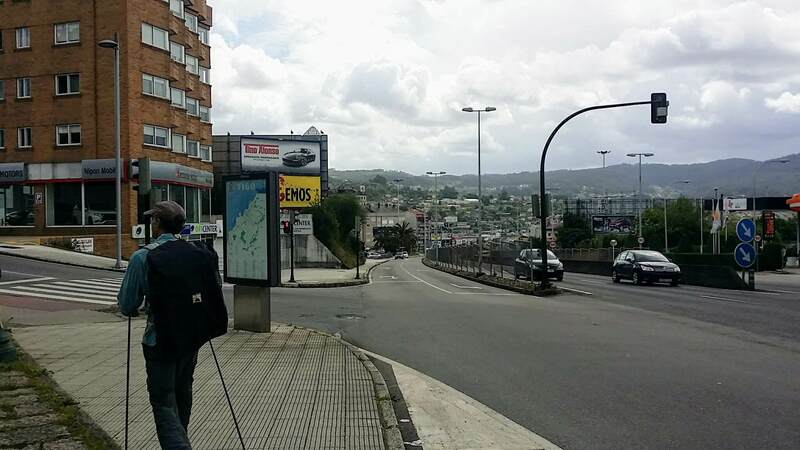 Here is Rich, walking along the street, toward the center of town after turning onto the main street, the Rúa de Leonardo Alonso. 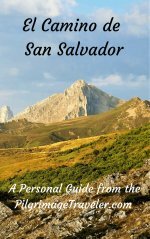 As we were walking through Matamá we started seeing crowds and heard a commotion up ahead. We had stumbled onto a little parade going through town. I have no idea what the celebration was about, and I didn't ask. Something celebrating the farmers of the area perhaps? Oxen and peasants with scythes. Hmmm. After the small parade went by, a great smelling bakery caught our eye! Or shall I say, caught our nose? We stopped in at the Panadería San Amaro in the center of town, which I marked on the map, as I would indeed recommend it! At the counter, being pegged as pilgrims (and foreigners), the proprietress started nudging her daughter, about 12 years old, to interact with us in English! I caught the nature of her conversation. She wanted her daughter to practice her English on us, that she had learned in school! We smiled at her, as she shyly approached the counter. We spoke English to her, asking her for a loaf of bread. She spoke back to us very well. The encounter was darling. We stuffed the delicious long loaf of bread into Rich's pack, after eating half of it and traveled onward. It was only 250 meters along this stretch through Matamá, but what an interesting stretch it was! 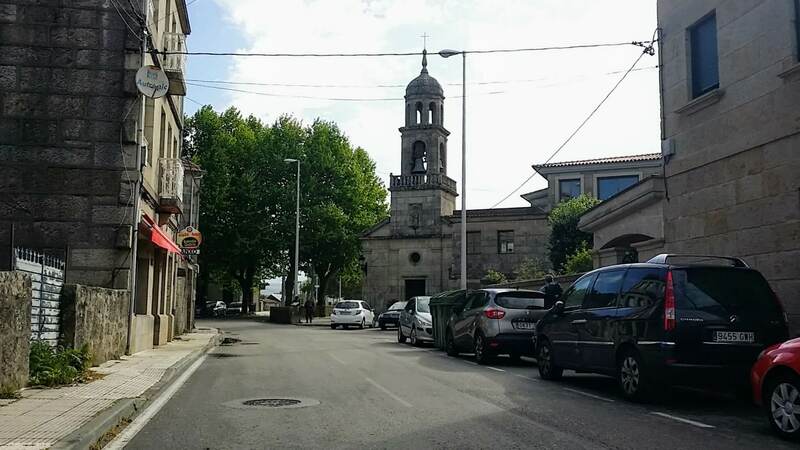 At the interesting Iglesia de San Pedro de Matamá, below, we turned left to walk down the Camiño Real. 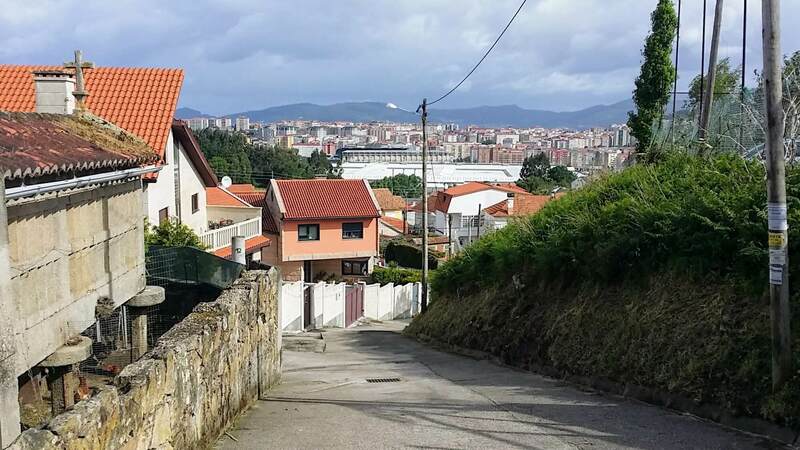 Here is an interesting juxtaposition of the old hórreo, with the factories in the the background, walking down the Camiño Real. 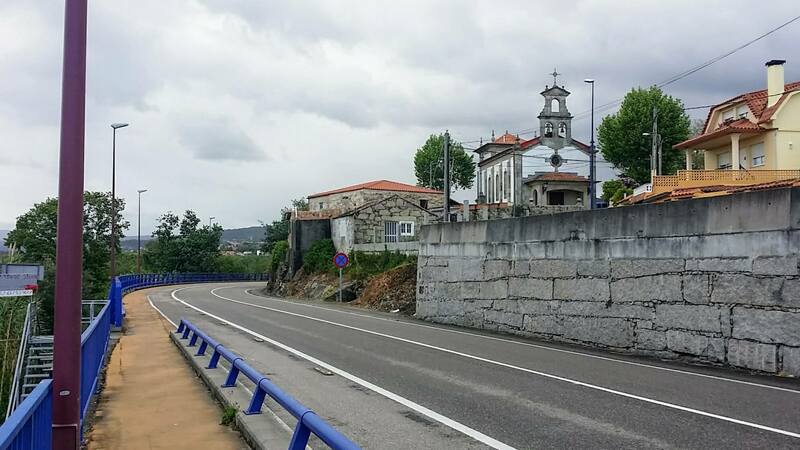 After walking 0.4 km on the Camiño Real, then straight onto the Rúa do Castro, turn left onto the Rúa do Roupeiro. 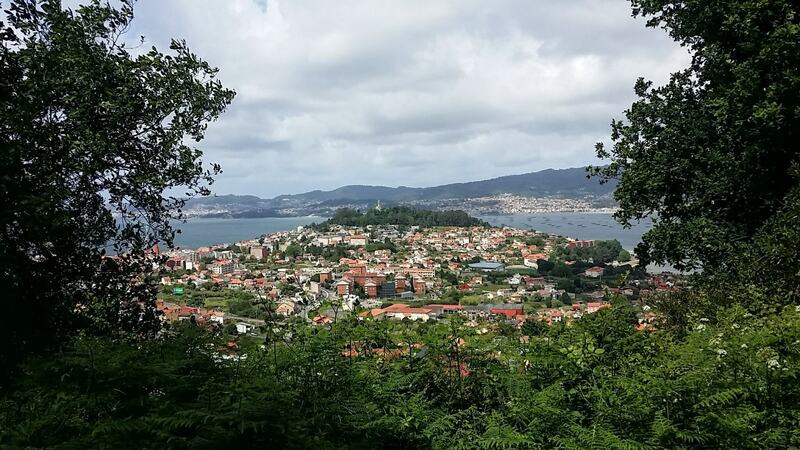 Here is another hórreo we passed along the Rúa do Roupeiro. 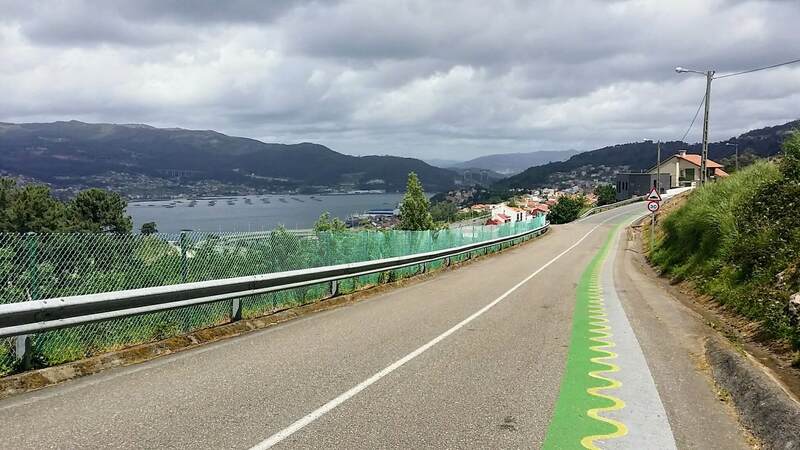 Then the Camino follows the Rúa do Roupeiro right after 0.22 km, descending the hill steeply on switchbacks, heading toward the center of Vigo. 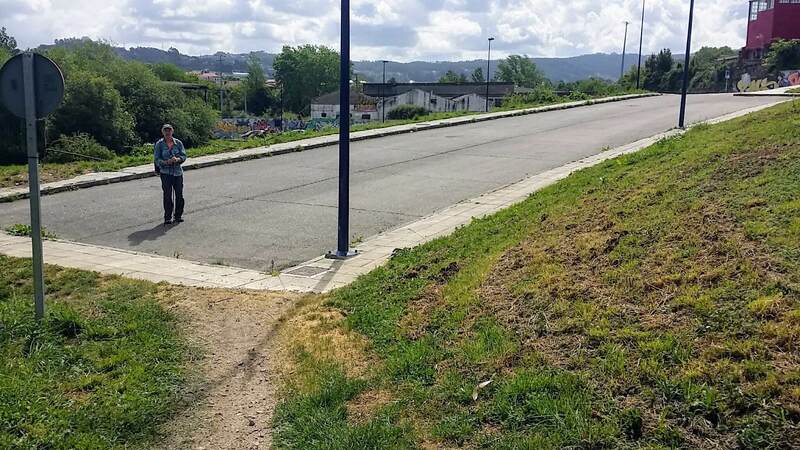 At the bottom of the hill there is a high concrete wall on your left that you follow. This wall contains the Peugeot-Citroën manufacturing buildings. 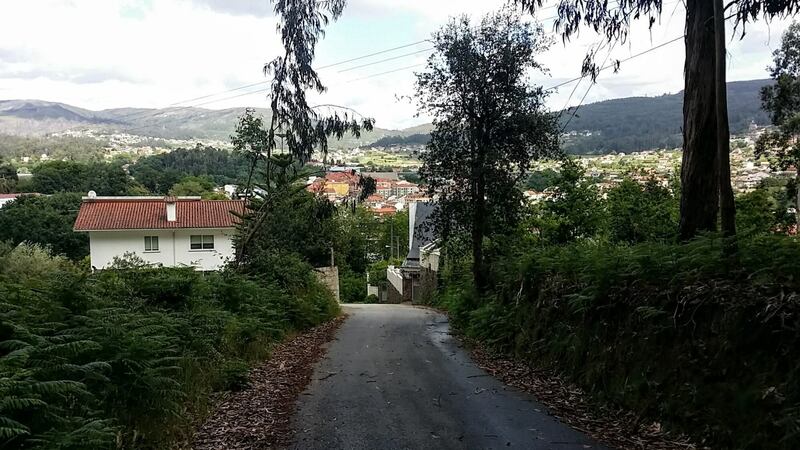 After another 1/2 km on the Rúa do Roupeiro, the Camino turns left to the Camiño de Sabarís on a narrow paved road. Continue to follow the road until it turns to dirt, and walks under ugly power lines. When the road bends to the right, stay straight on the dirt road, photo below. Continue straight on for about 1/2 kilometer, pass by an electrical distribution area and come out smack into town and onto the Av. do Alcalde Portanet. This is where the alternative route joins the Coastal Route. 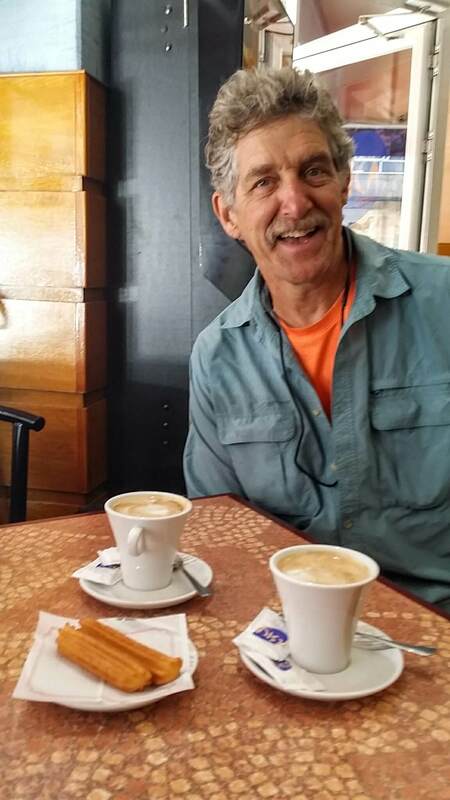 When we got on the main avenue, we decided we'd had enough walking for awhile and stopped at the first place we saw, the Cafetería Yesica for coffee. 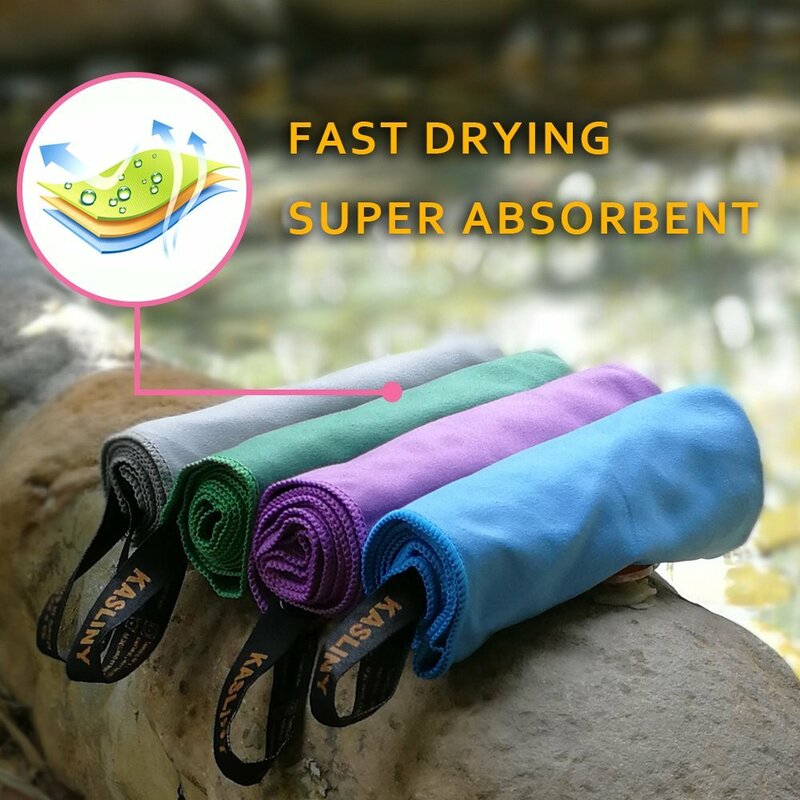 We are always thrilled over life's simple pleasures! If Vigo is your destination for the day, you may want to book a hotel, by clicking here. As of this writing there are no albergues here, to my knowledge. I was surprised at this juncture, that we had seen almost no pilgrims. I commented about it to Rich at our break. I suppose it may have been that we had started in the middle of a traditional stage. 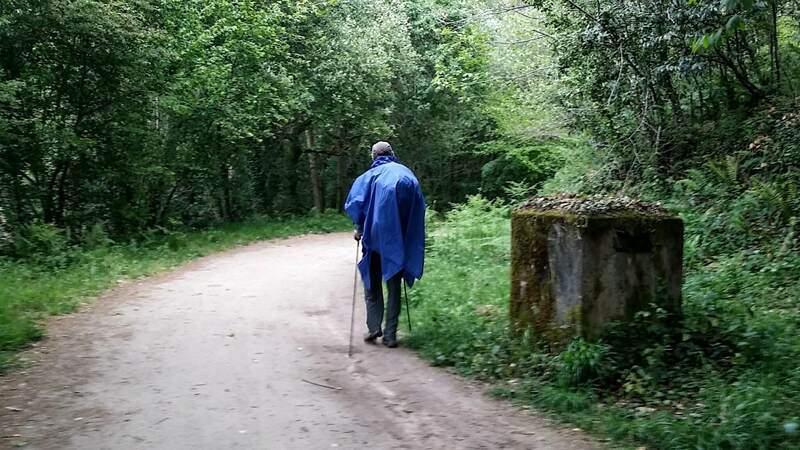 But even so, there are always stragglers at every point along the Camino it seems! Neither of us had any answers. We carried on, and immediately after the café, turned left onto a pedestrian walkway, and then after a block turned right at the next intersection, and onto the Travesía da Ponte Romano. 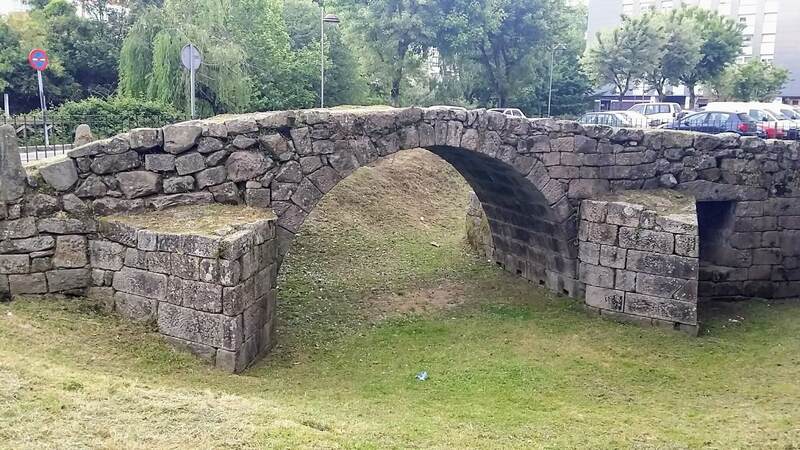 This little street walks you by a remnant of an historic Roman bridge, the Ponte Romano. 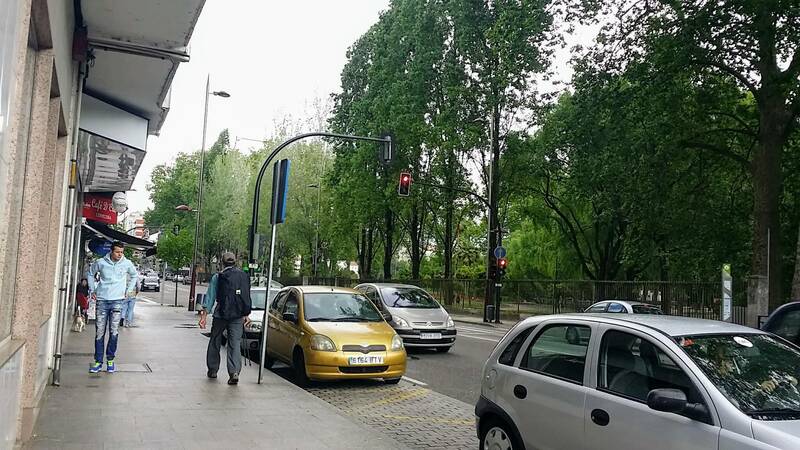 In about 100 meters only, this side street brings you out to the main road, the Avenida de Castrelos that runs along a very large park, the Parque de Castrelos. Cross the Avenida into the park. 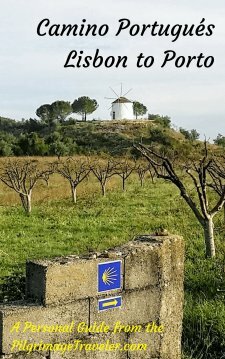 Walk northeast across the park, following the yellow arrows, for about 1/2 kilometer, then on the other side, join a really nice trail system, the Senda do Lagares that leads you along a canal and along the Rego Lagares River. 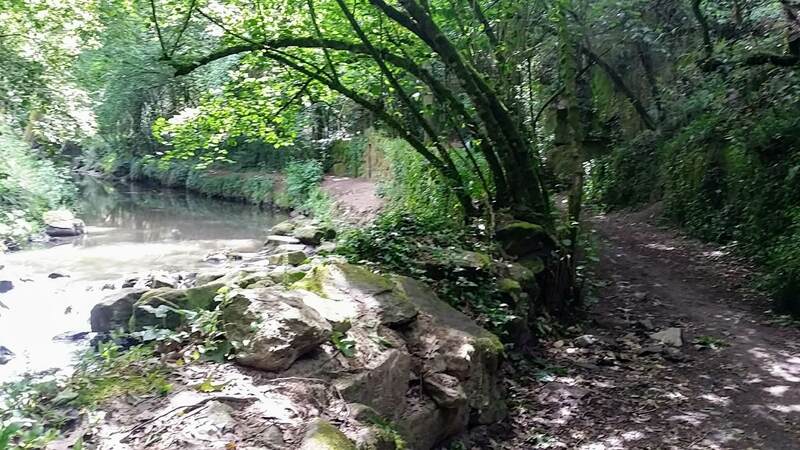 It is shady and lovely along here. At times you have to look very carefully on the trees for the faint yellow arrows through here. ...until you come out here, at this road end. There were no waymarks at this juncture or the next, and we looked around confused as we wandered around a bit. A kind old man sitting at one of the buildings was watching us, and waved and pointed us in the right direction. I am positive he was a trail angel! Maybe we weren't so alone after all? 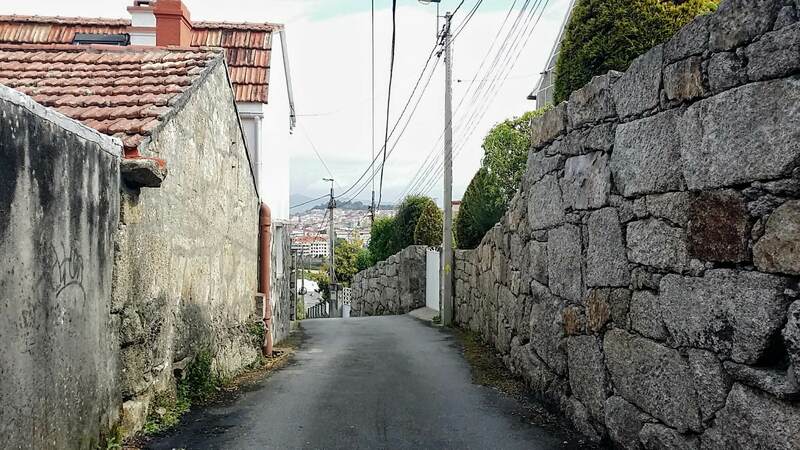 Walk down the spur road, to the Rúa Enrique Alonso Xalueiro and turn left to follow the road down the hill and by a funky old wall with very colorful graffiti on it. You can barely make out the graffiti in the background on the photo, below. Rich at Dead End Spur Road ~ Walk Down It! 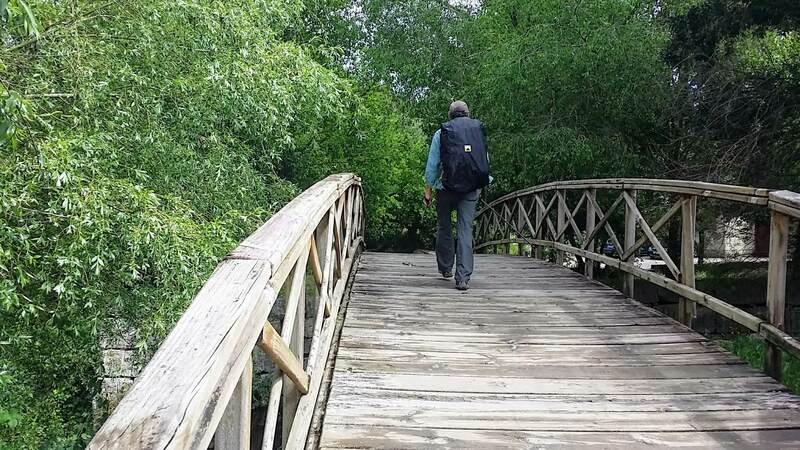 After 200 meters, the road peters out and becomes a footpath once again, and it crosses the River Lagares on this nice little footbridge. I had noted in my voice journal that this area felt like "over the river and through the woods!" 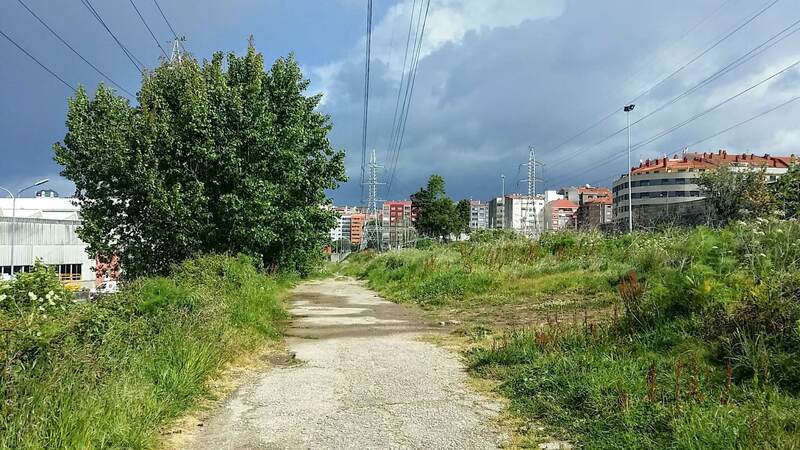 Ahead, the path joins the Camiño Carreiros, following the yellow arrows, to turn left. 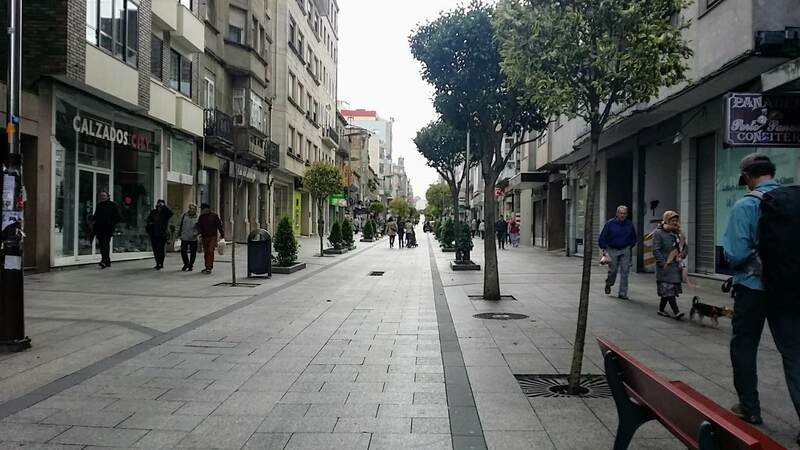 We were still seeing no pilgrims, even after walking through the center of downtown Vigo. Very interesting, indeed. After the river, there is a long climb upward, from here, all the way to the San Roque church, so get ready! 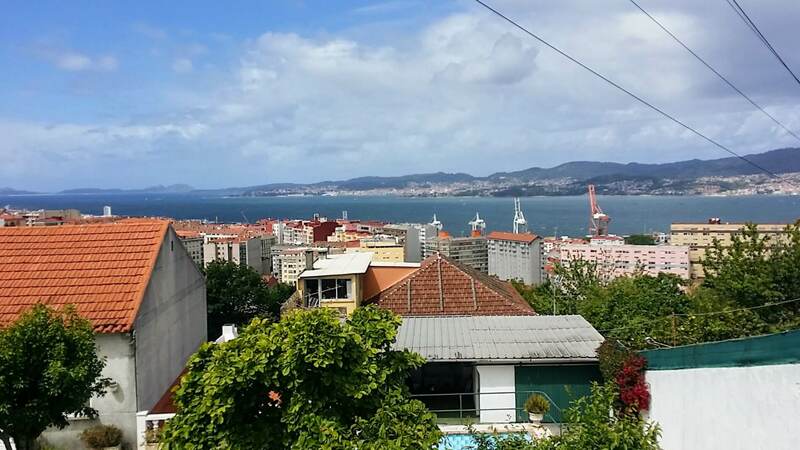 Walk straight on the Baixada á Salgueira and up the hill. In a half a kilometer, come to a T-intersection. 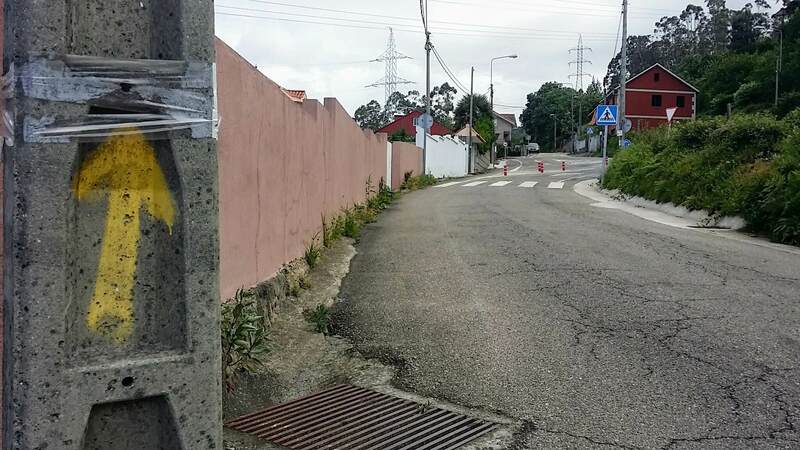 Follow the yellow arrow on the pole and turn right onto the Rúa do Carballo. 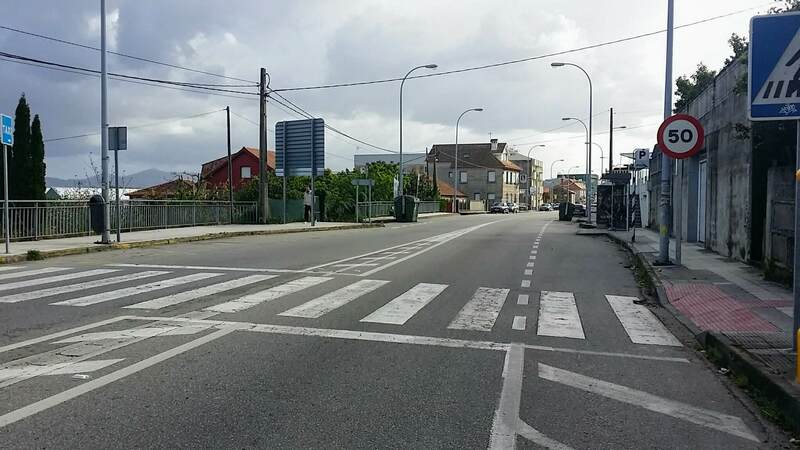 After 1/3 kilometer, when the road ends take a left and then an immediate next right, onto the Rúa do Loureiro. 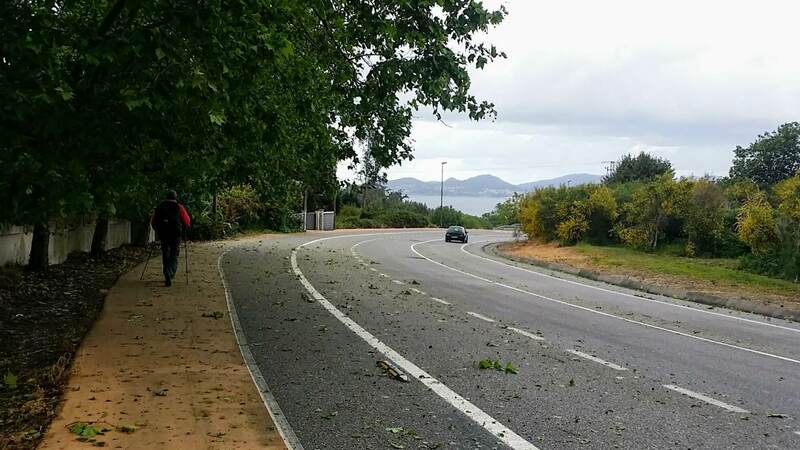 In only about 100 meters, come to the highway, the N-120 and cross over to the Rúa de San Roque. You are almost at the top of the hill! Walk a few meters more and turn left to continue on the same street, climb a steep hill on pavement that ends in a set of stairs. 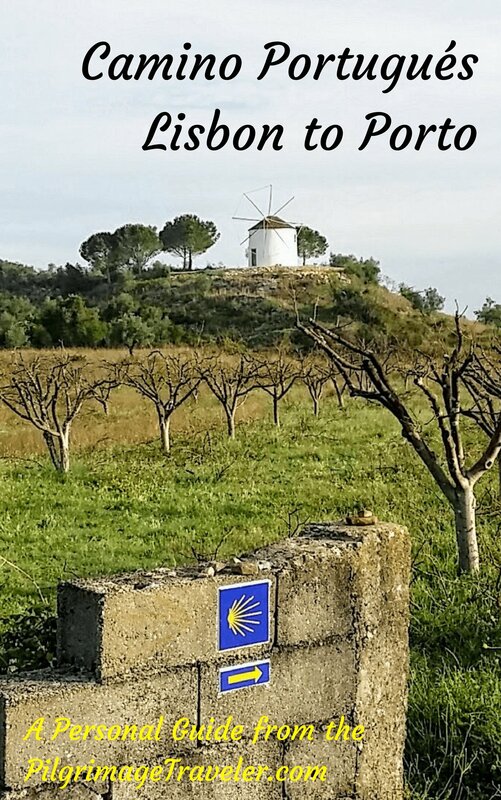 Rejoin the road and pass the entrance gate to the Ermida de San Roque after 200 meters from the highway. Make the second right to stay on the Rúa de San Roque. You are finally at the top of the hill! 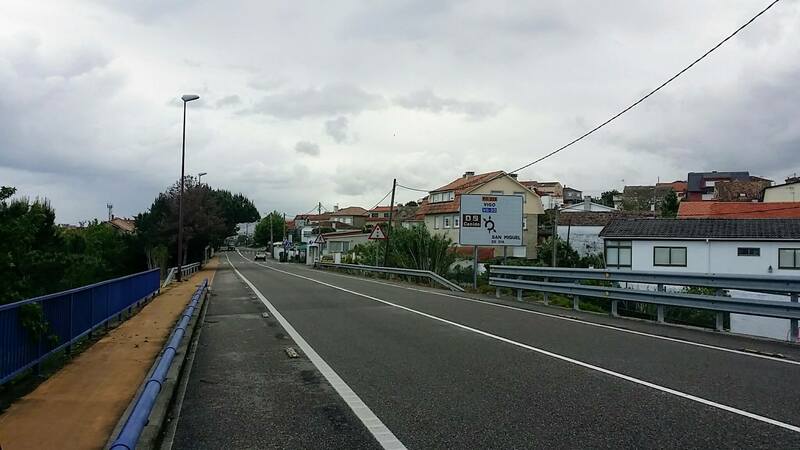 At this juncture, we were started the next traditional stage, with 15 kilometers left to go to Redondela. We were halfway into our day twenty-one on the Portuguese Way. It was already 1:00 in the afternoon and we hoped to reach Redondela by 4:00 p.m. 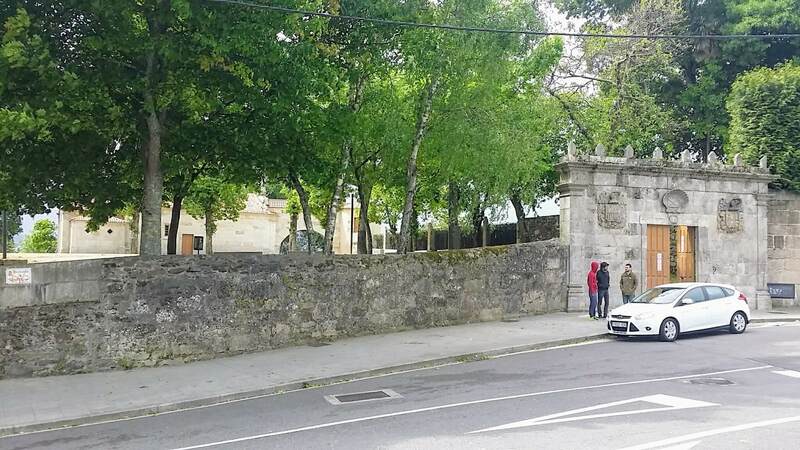 Walk 1.6 kilometers onward and turn right to stay onto the Rúa de San Roque. Walk another 170 meters, and turn left on the Av. Alcalde Gregorio Espino for only 70 meters, then turn right onto the long walking street on the Rúa de Urzáiz in the district of San Paulo. The shops provided a nice diversion. Walk on this shopping plaza for 1/2 kilometer. Then turn left on the Rúa de Toledo and walk for another 1/4 km, come to an intersection. 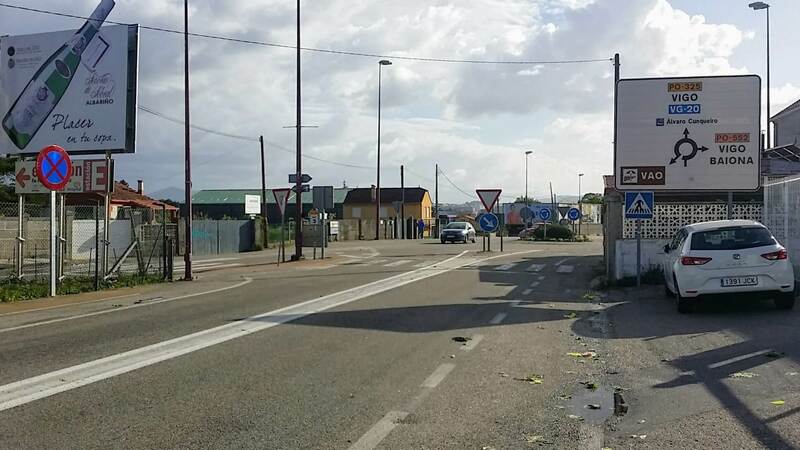 Turn right here, below photo, to stay on the Rúa de Toledo. Walk another 360 meters on the Rúa de Toledo. Turn left onto the Rúa Cantabria. Cross the N-556, here. 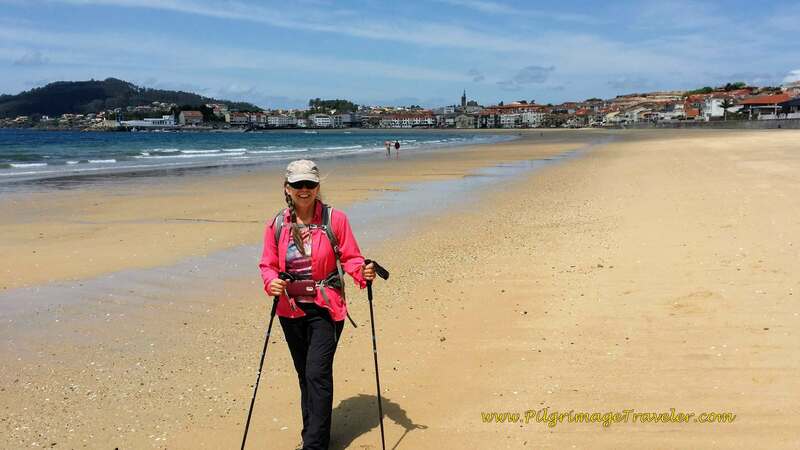 Continue to walk on the Rúa Cantabria for 0.9 kilometers. 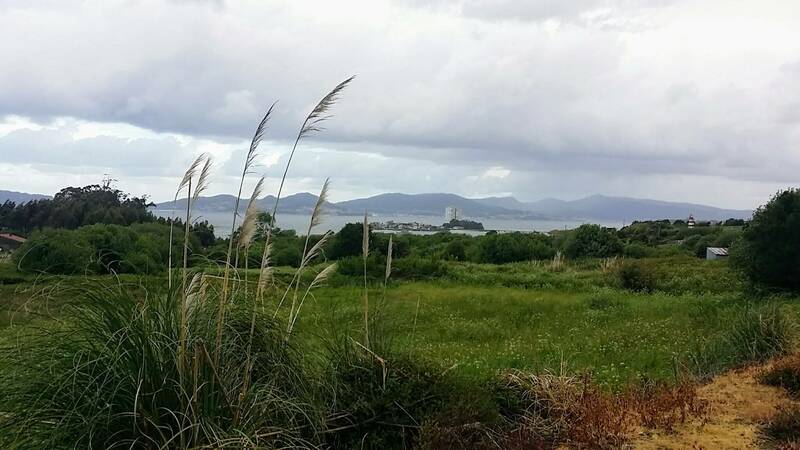 This is an uphill walk, and the views of the Ría de Vigo abound. Keep climbing and turn right on the Rúa da Pouleira. After walking another 1/4 km, turn left on the Camiño Poulo. It is here that the Senda da Auga begins, a trail system that is essentially flat for the rest of the day! Yay! 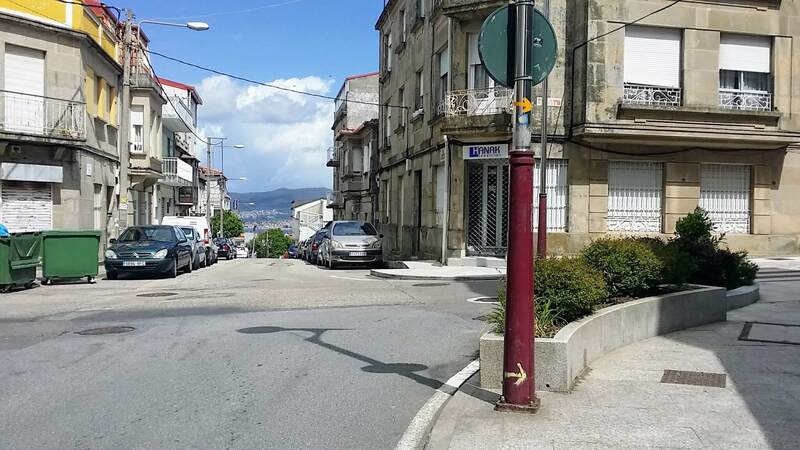 After 300 meters on the Camiño Poulo, stay straight on where the street becomes the Camino Pedrosa. 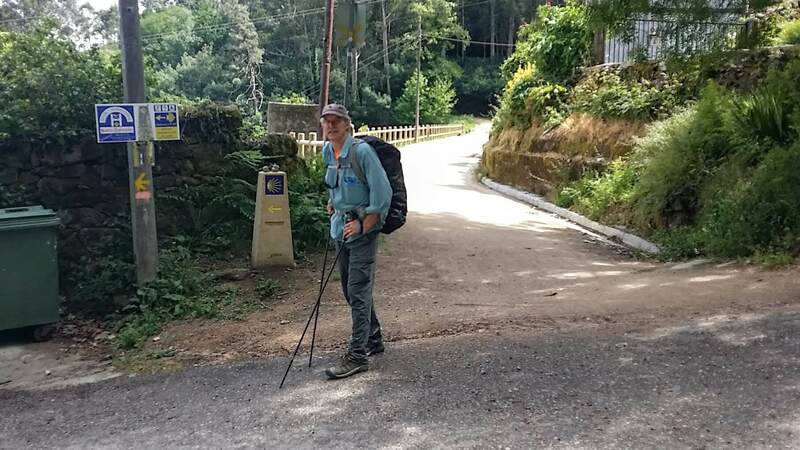 In another 100 meters or so on the Camino Pedrosa, stay high and turn right onto the Camiño da Traída das Augas. The route gets decidedly more rural and the lush green of the spring forest accompanied our journey for almost 2 kilometers. We would catch glimpses of the bay below, through the trees. Farther along we walked through more clusters of homes, with open views of the bay below. Quite pleasant. We could see views of the shipyards below. Vigo is a busy port. We were glad we were walking above it all on this nice, flat, view-laden path. 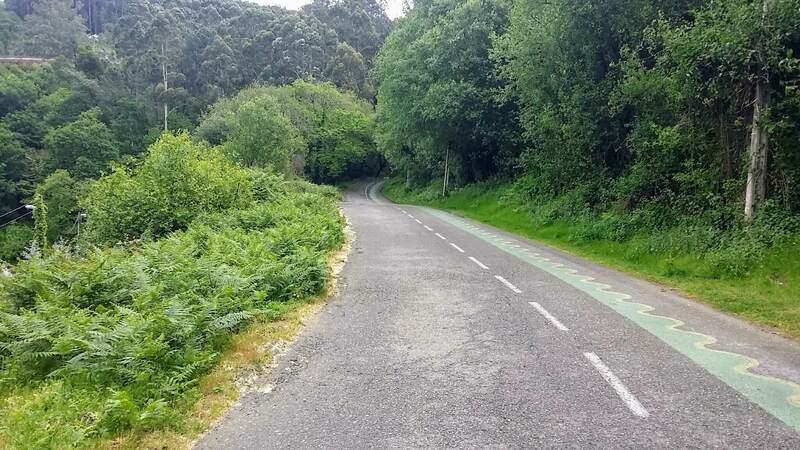 Then a short, slight descent and we join a wider road, to continue on the Camiño da Traída das Augas. 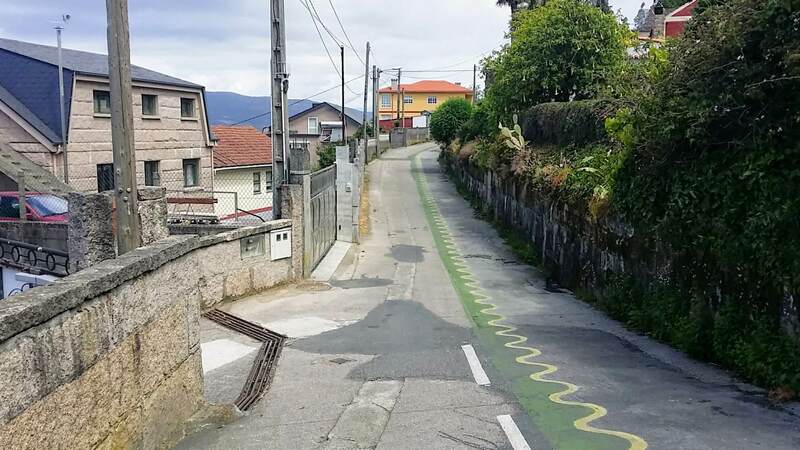 Following the Senda da Auga and its green, wavy lines, the Camino turns left here in a few meters, to leave the wider street for this narrow one. We stopped along this section to have a bite to eat from our packs, keeping an eye on the building storm clouds. We didn't linger, but gobbled down some snacks and threw our packs back on to get going before it rained. We put on our rain gear, just as it began to sprinkle. 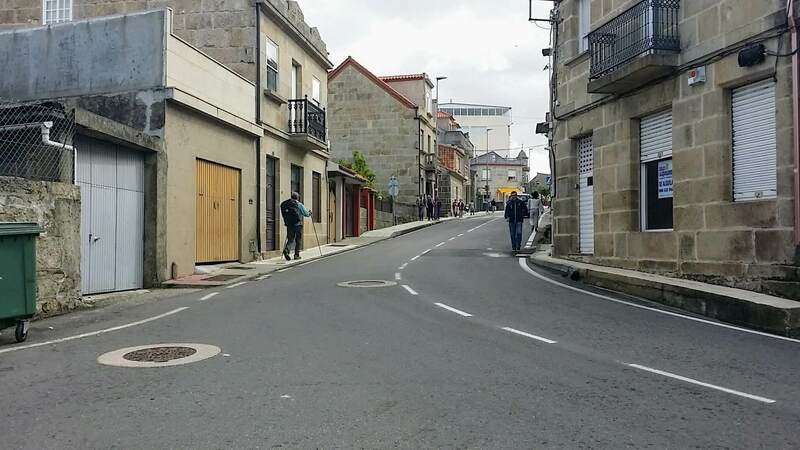 After 2 km (as noted above) on the Camiño da Traída das Augas, the street becomes the Camiño de Valeiro. 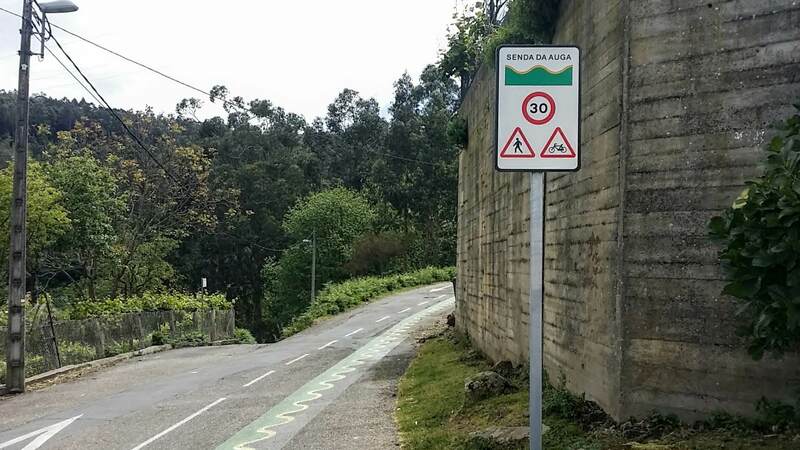 In only 200 meters, stay straight on, where the street becomes the Rúa Subida a Traída. 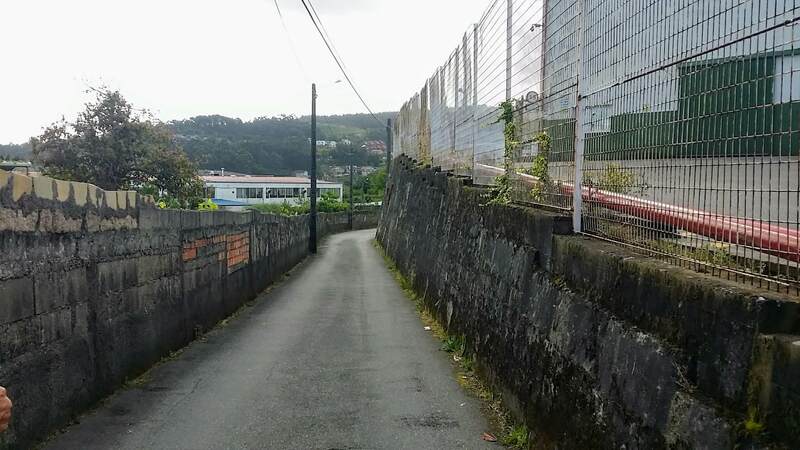 In another 200 meters, the road becomes the Camiño da Traida. In about 1/2 kilometer, the street turns to dirt, the painted, wavy lines disappear, but the trail system continues and walks the pilgrimage traveler back into a forested area. Almost as soon as we got on our rain gear, the sky cleared and became blue again! 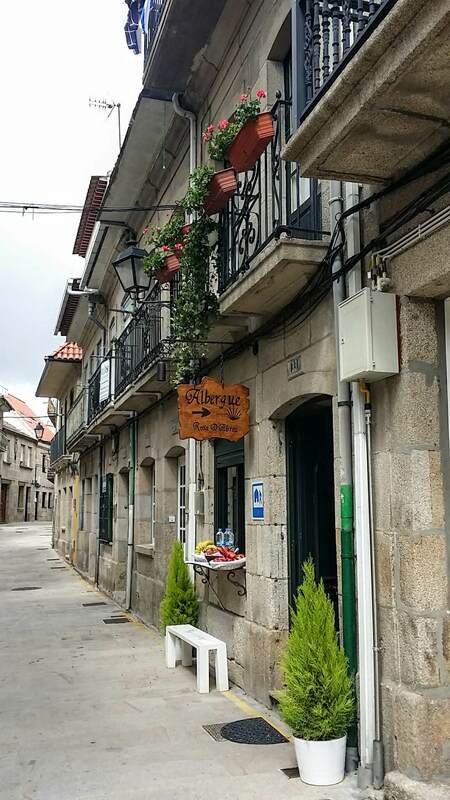 After 400 meters, walk uphill, out of the forest, and back into town to join the Camiño da Traida again. It is a quiet side road through town. Everything is well-marked, with arrows, and signage to ensure that you are on the Coastal Route! Essentially, don't climb too far up or down any hills, and you will be on the right path! 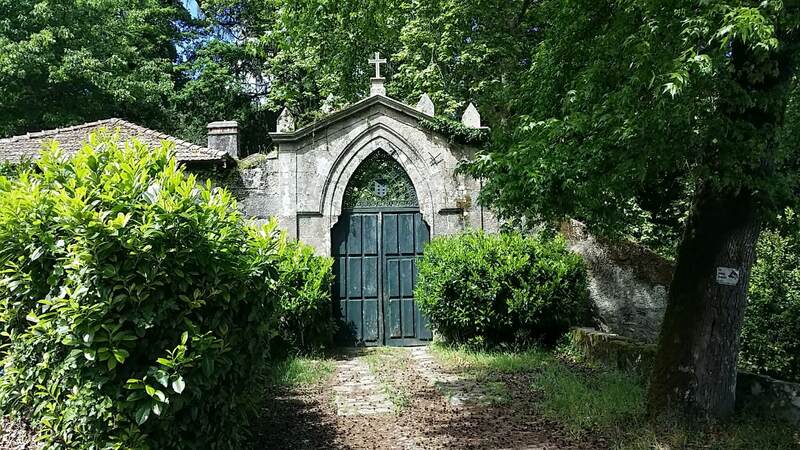 The Camino Portugués on day twenty-one on the Portuguese Camino is lovely here for this very reason. Not strenuous, but entirely flat ~ the kilometers tick off fast! 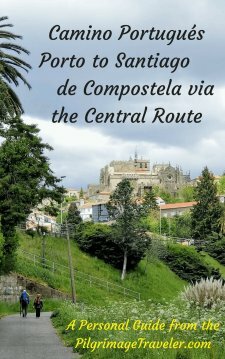 We now had seen maybe three or so pilgrims along this stretch, and along our entire day twenty-one on the Camino Portugués! Amazing! The views below are still with us, showing the possible oyster pens in the water below. If anyone can confirm that these are oyster pens, please write to us and let us know. In the next section, the Coastal Route alternates between pavement and dirt roads. 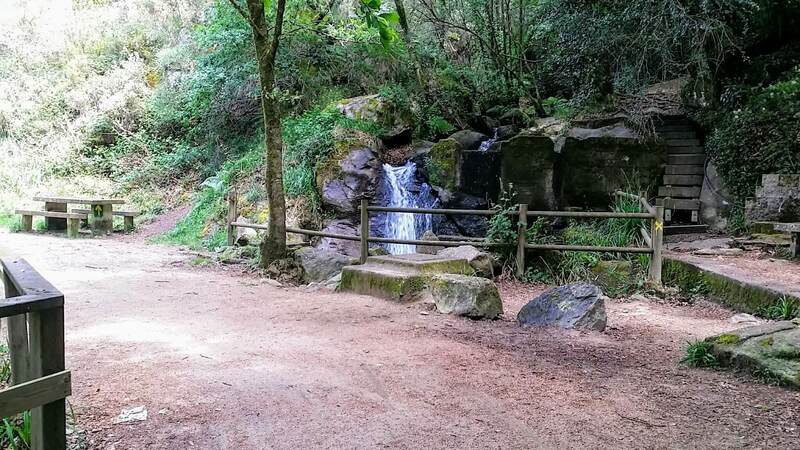 In not quite another kilometer, come to this lovely waterfall on the Rego Fondón and picnic area. 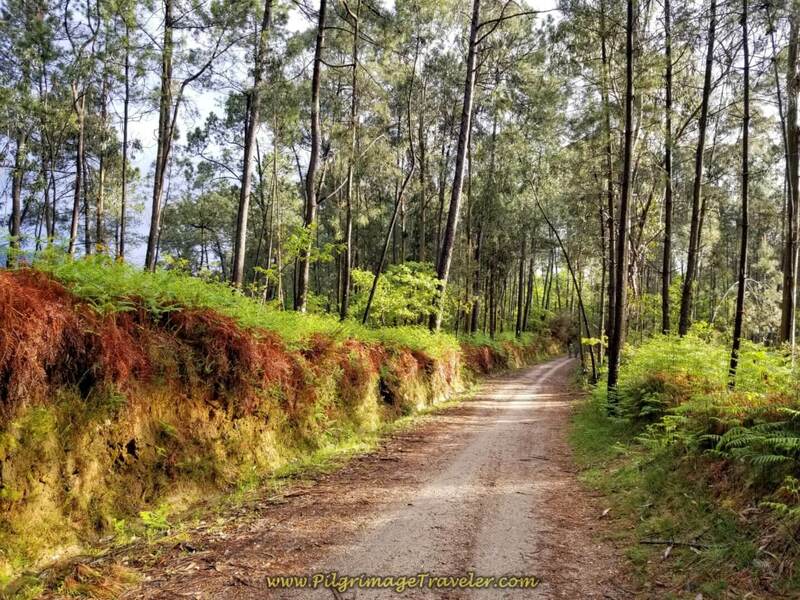 Do not turn off the road and onto a separate trail (the Ruta Rio Molinos Fondon), but stay straight on the direct road. This would be a lovely place, on a hot day for a rest and a picnic. Follow along the dirt road for 1.2 km and marvel at the views from the lofty heights of this amazing trail system. 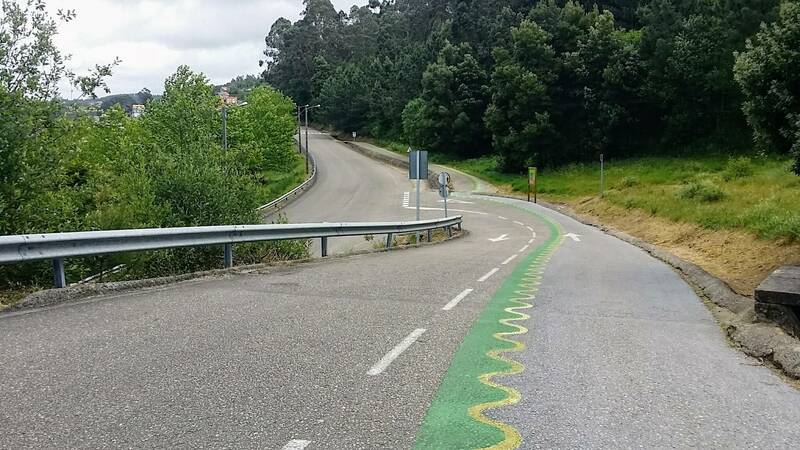 Join the pavement once again on the Camiño da Fenteira. Continue on for 0.8 kilometer, where you come to a Y. Go left here onto a dirt road. 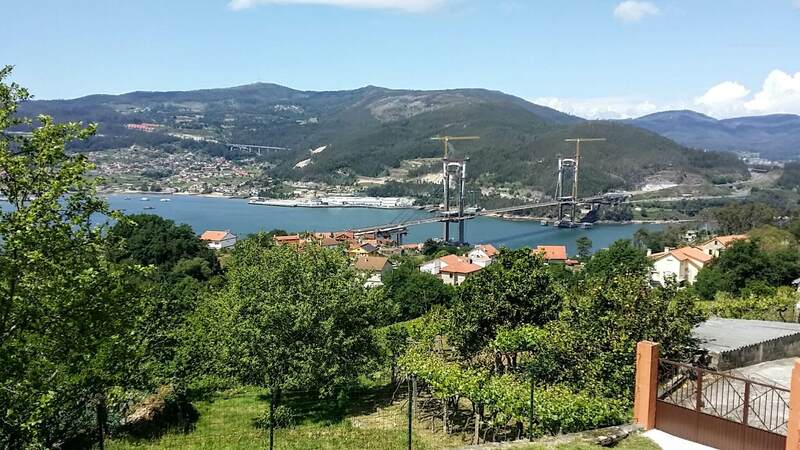 Here is a view of the famous bridge, the Puente de Rande a marvel of modern architecture suspended across the Vigo River estuary. Walk almost 2 kilometers more, following the signs on dirt roads, for the final plateau push before Redondela. This forest road made for a lovely, solitary walk. The Senda da Auga ends here, after a total of about 11 wonderful kilometers, turning left on the Camiño Condesa de Torrecedeira. Now we start the final steep descent into Redondela. Signs for accommodation are now abundant! Descend steeply on the Camiño Condesa de Torrecedeira. 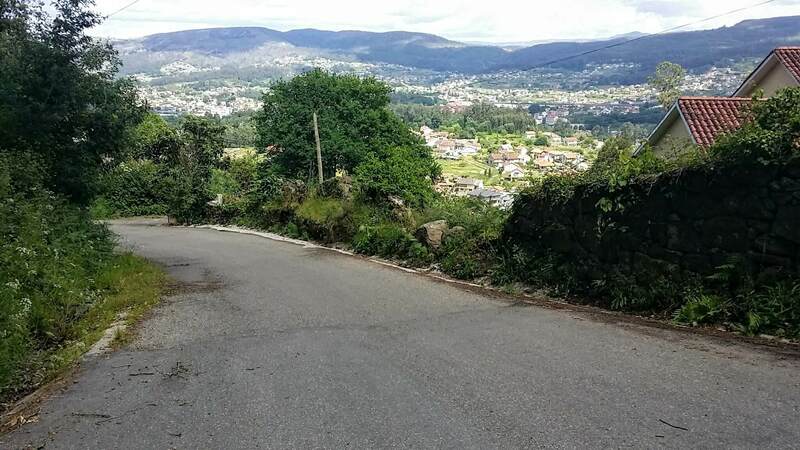 Continue downhill on the Camiño Condesa de Torrecedeira for 0.77 km , descending into Redondela until the bottom of the hill, where the street becomes divided. 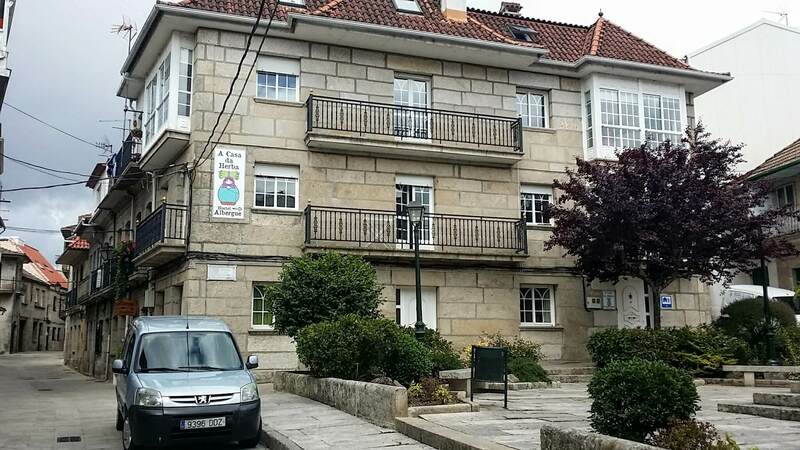 Turn left on the Aldea Cruceiro street and past a school on your right. 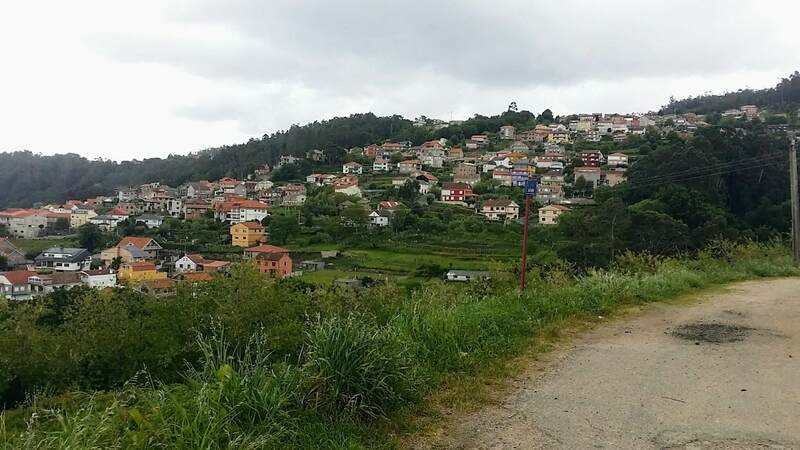 Walk 1/3 km on the Aldea Cruceiro and turn left on the Estrada Subida Cedeira. 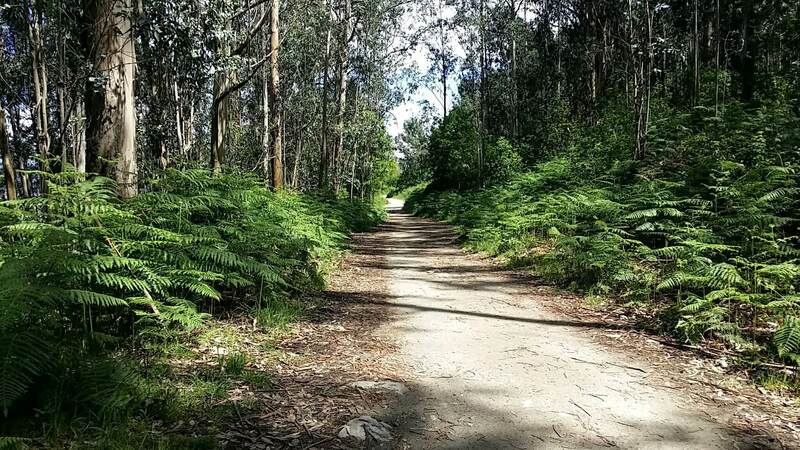 Walk 200 meters on the Estrada Subida Cedeira and turn right onto the narrow Camiño das Cardosas. This is a lovely little street on the outskirts of town. 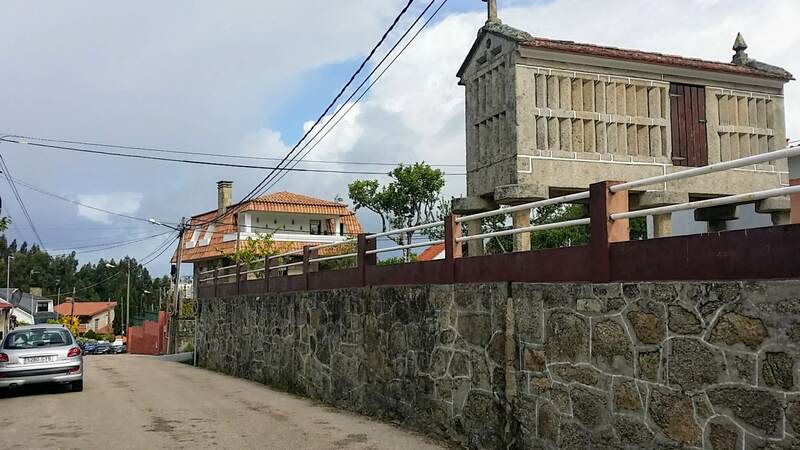 Walk 0.6 km total on the Camiño das Cardosas and as the road steepens and looks like it is going nowhere, suddenly it comes out at the railroad track, turns and walks under the tracks and brings you the Estrada Vigo, the N-550, smack in the town of Redondela. Turn right on the N-550. There are narrow sidewalks here to keep the pilgrimage traveler safe. Walk 300 meters south on the N-550 to the first roundabout. 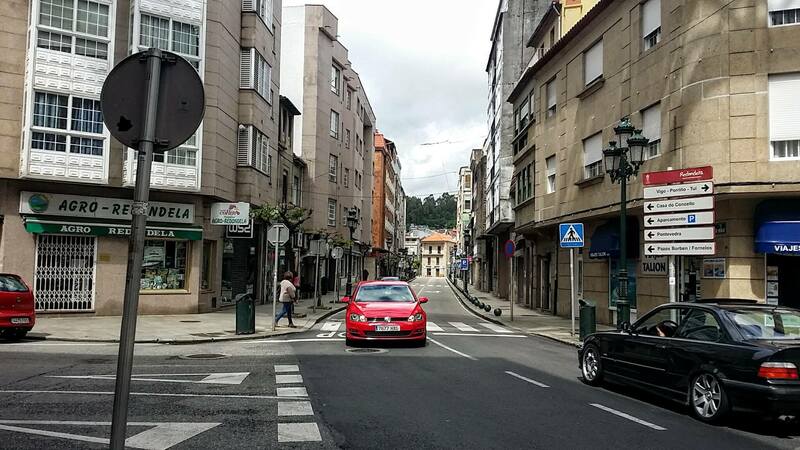 Take the first left onto the Avenida de Vigo. 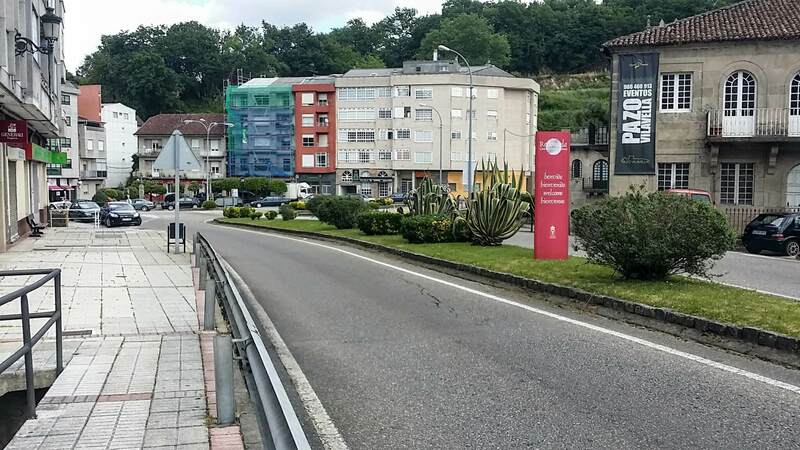 In a few meters, bend to the left (north), cross the bridge and see the red "Welcome to Redondela" sign at the Praza Ponteareas. 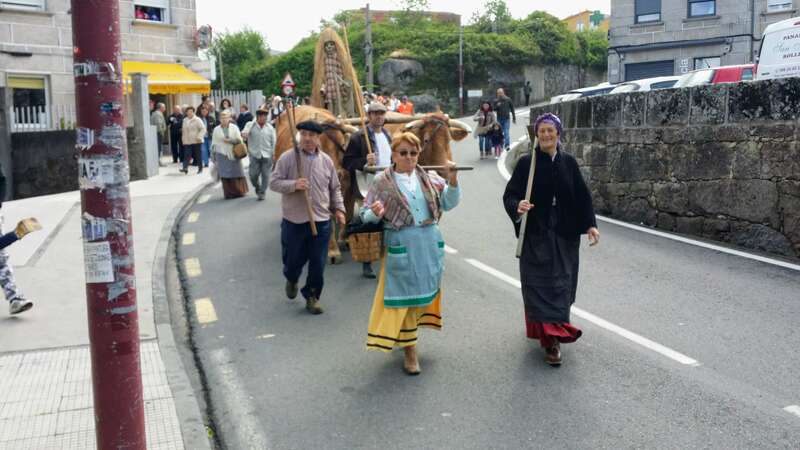 Stay to the left and join the Rúa Pai Crespo to walk into the heart of town. In 200 meters, at this juncture with the Rúa José Regojo, below, there is a funky overhead bridge-type architectural feature. Look to your right and you will see waymarks on the tower or "torre," leading you to a lovely side street for pedestrians only, called the Rúa Rita Otero. Walk 170 meters or so on this walking street, and come out at a busy street. There is a roundabout to your left, and across the street is a plaza with the Albergue Público de Peregrinos in sight. Carefully cross the street to the albergue. It was full when we arrived. All the pilgrims we didn't see on our day twenty-one on the Camino Portugués had beaten us here!! Ha ha! ...and just beyond it, the Albergue Rosa D'Abreu where we stayed after walking another 170 meters. 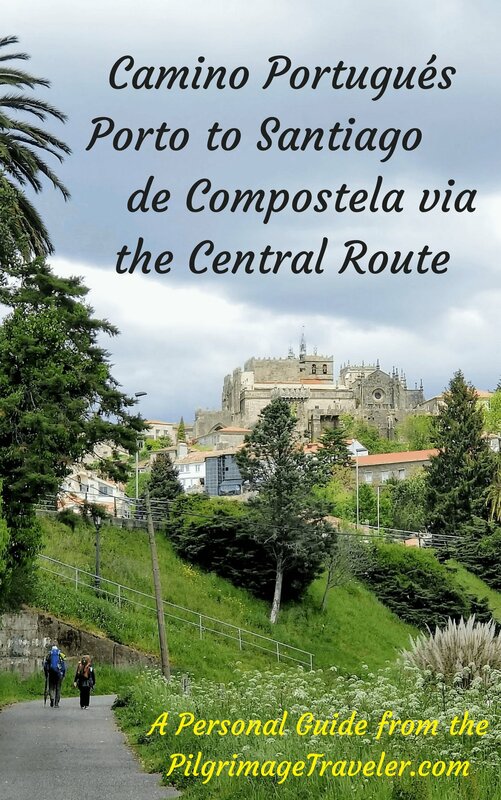 The Camino walks directly by these three albergues, within minutes of one another. We arrived after 4:00 p.m. and settled on the Rosa D'Abreu, a privada, in order to get lower bunks. 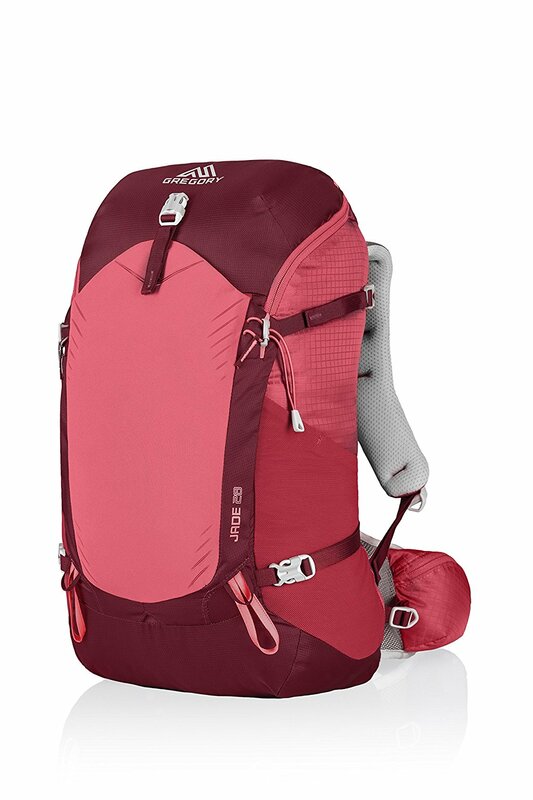 I would not recommend the Albergue Rosa D'Abreu. There was no hot water available for our showers. When our roommate, Irina from Latvia, complained, Rosa said, "Oh I have to change the gas." But our showers were cold. I think she just turned the gas on and off at will to save a Euro. There was no heat all night either and it was a chilly night! I should have been suspicious when Rosa knocked on our door, that afternoon, offering more blankets! Even though I was warm enough in bed with the extra blankets, it was frigid when I got out of bed in the morning. Rich and I jokingly said the place should be called the "Rosa O'Fria" instead of the Rosa D'Abreu! We did like the small rooms. This was clearly a 3-story house converted into an albergue. We had only 3 beds in our room, one single and one bunk. Irina slept in the top bunk. It had only one small bathroom for the entire house that you had to wait in line to use. Plus the bathroom had no lock. Argh! You can purchase her continental breakfast for 4 E each, but we found it wasn't worth it. It consisted of coffee and bread only, with a few small pieces of tortilla. Mostly it was her whole atmosphere of squeezing the Euro until it hurt! Plus Rosa was a bit snide with us, but oh-so-much-more friendly and flirty with the group of Spanish cyclists that arrived later. I secretly wondered if she charged foreigners more. Not a very friendly place, in my humble opinion. 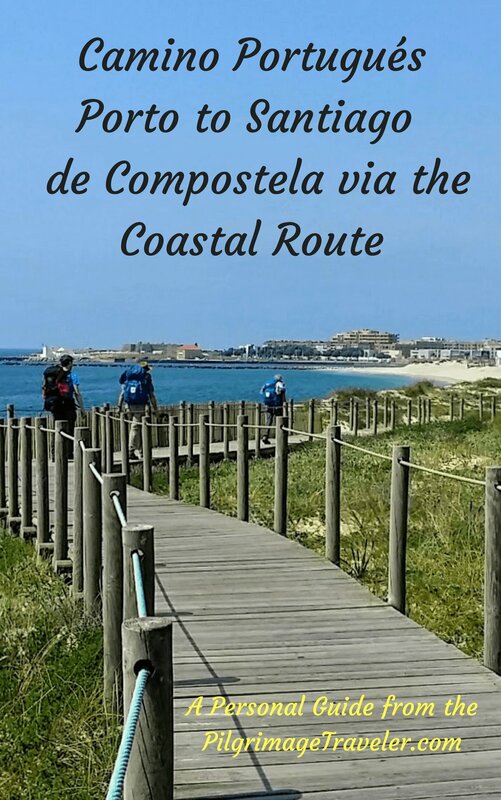 There are many, many hotels and albergues here in Redondela, where the Interior Route joins the Coastal Route from which to choose. Check the accommodation guide for more, or click here to book a hotel! So many options for the pilgrimage traveler! That evening, after our routine of cleaning up and washing our clothes, we stumbled down to the main square. I was not in the mood to explore much ~ very unlike me, so I have no pictures of the town. In fact, I felt rather closed that evening. Not sure if Rosa put me in this mood or not. Maybe the cold shower did it, or maybe I just didn't want to leave the coast! That afternoon in our room, when Irina started talking about this man she fell in love with on the Camino, a 40-something lady acting like a teenager, I just smiled, while my mind remained totally blank! I just could not be present to her experience, no matter how hard I tried! On our trip through town, we did find an amazing, friendly hamburger joint where they made the biggest hamburgers I have ever seen in my life for less than 5 Euro! It was by the city hall in the park, called the Los Leones Hamburger Place. Check my Google map above if you are are interested. I was so happy with my good 'ole hamburguesa and apparently Rich was too, because he ordered a second one after he ate the first! The bartender just laughed at him as he said he was very, very hungry! We had essentially not eaten a real meal on our 30k day, but only a few snacks. We also quaffed down a few beers to make ourselves feel better. At least I did! And yes, it did make me feel better. While we had been advised by some that Vigo is ugly to walk through, we actually found it to be quite nice and much better than expected. We saw many things that pleased the eye and the Senda do Lagares along the river in the middle of town was an unexpected surprise. We especially enjoyed the high plateau walk of the Senda da Auga as well. 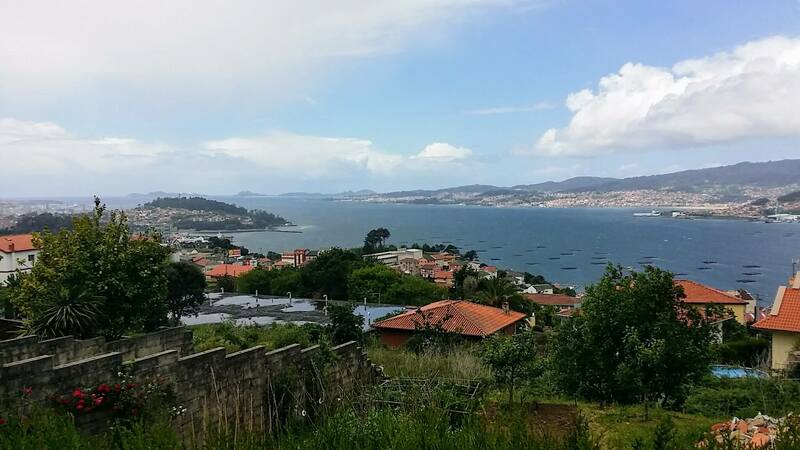 We thoroughly enjoyed our day twenty-one on the Camino Portugués. It was indeed, a solitary walk together. I never felt alone. I felt invaded upon when we joined the throngs of people and pilgrims in Redondela. My solitude had come to an abrupt end at the beginning of our Central Route. I was sad to be leaving the warm, sunny coast for the high, cooler uplands of Galicia. Now, the heart of Galicia was in front of me. It was going to be an uphill climb from here to Santiago de Compostela, literally and figuratively. May your own day twenty-one on the Camino Portugués be filled with lovely moments of the glory of solitude, if you so desire. 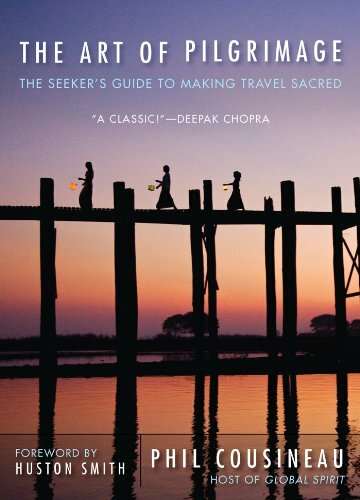 Or may it be filled with true companionship of other pilgrimage travelers. Whatever yours brings, may you have as lovely a day as we! Ultreia!